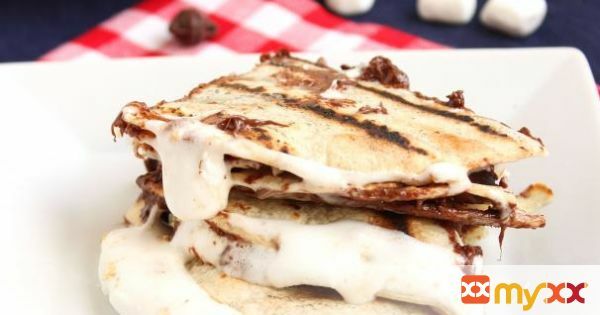 All the gooey, goodness of the classic s'more stuffed into a toasty, crispy quesadilla and grilled. The perfect treat for any camping trip or barbecue! 1. Lay the corn tortillas on a grill grate over a medium flame. 2. Immediately top four of the tortillas with the chocolate chips, marshmallows and graham cracker crumbs. 3. Allow the marshmallows to begin to puff up and then top with the remaining tortillas. 4. Allow to cook for an additional minute and then transfer to a plate or serving platter. 5. Let the quesadillas rest for 1-2 minutes and then cut with a pizza cutter into four triangles. Serve immediately.